Authorities intercepted packages containing homemade explosive devices addressed to former president Barack Obama in Washington and former secretary of state Hilary Clinton in New York, with another being discovered at CNN headquarters in New York, addressed to former CIA director John Brennan, according to the Washington Post. The suspicious packages were located after an explosive device was found in the mailbox of liberal philanthropist George Soros’ New York home earlier this week. The devices sent to Clinton and Obama were found during screening and did not make it to them, officials told the Washington Post. “The devices have been what appear to be pipe bombs,” John Miller, the New York police deputy commissioner of intelligence and counterterrorism told the Washington Post. Politicians on both sides of the isle were quick to offer condemnations and call the incidents an attempted terrorist attack. That included President Trump. “In these times, we have to unify,” he said. “We have to come together and send one very clear, strong and unmistakable message that acts or threats of political violence of any kind have no place in the United States of America. Another suspected explosive device was found at the office of Florida Rep. Debbie Wasserman Schultz. Whoever sent the explosives used Wasserman Schultz as the return address. 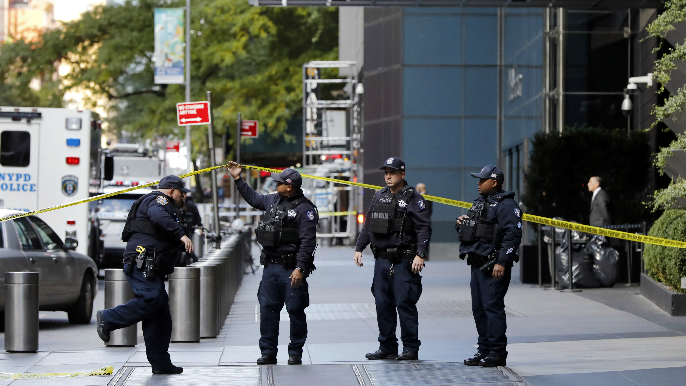 It is believed that the package found at her office was sent to former Attorney General Eric Holder, but returned to sender because it had the wrong address. A sixth suspicious package, sent to California Rep. Maxine Waters, was intercepted at a Congressional mail facility and is under investigation.